The 11th edition of the annual Dutch-Belgian Information Retrieval workshop (DIR 2011) took place on February 4 in Amsterdam. It was organized by the University of Amsterdam and the Centrum Wiskunde & Informatica. The focus of this year's workshop was on in- teraction, with the goal of facilitating and increasing interaction, especially within the local research community, and between industry and academia. The scientific program included demos, research papers, and compressed contributions. The keynotes by Nick Belkin and Gabriella Kazai provided intriguing outlooks on the future of IR evaluation. Boscarino, C, Hofmann, K, Jijkoun, V, Meij, E, de Rijke, M, & Weerkamp, W. (2011). 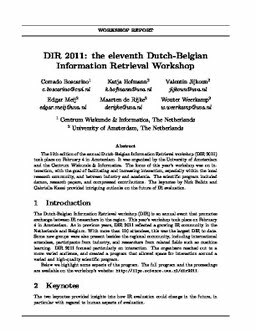 DIR 2011: the eleventh Dutch-Belgian Information Retrieval Workshop.